There was a buzz around Walt Disney World on the morning of June 1! Folks were shining up their cameras, Flick was combing his antennae, and Clay Shoemaker, Disney World Resort Ambassador, was straightening his tie! There was a hum rising from beyond Disney's Big Blue Pool, as the Voices of Liberty warmed up with a very special Anthem in their hearts! The United States Postal Service just released a brand new set of "forever" stamps! They brightly feature some of our favorite Pixar characters, bringing back sweet memories of when we first experienced those movies. 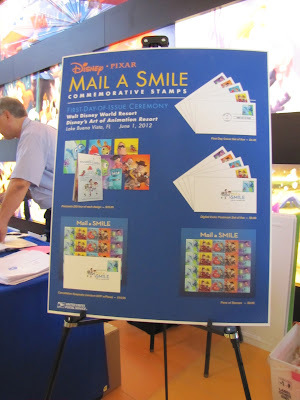 This endeavor, a partnership between the creative minds of Disney and the US Postal Service, has been nine years in the making. 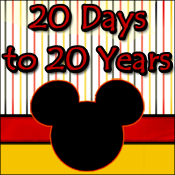 Their cumulative efforts have brought us to this day, a day of celebration! The celebration begins in the center of the brand new Art of Animation Resort; a perfect backdrop to the days festivities! As Nemo and Marlin look on in anticipation, Rick Allen, the General Manager of the resort, exclaims that "the Art of Animation Resort is taking us back to Walt Disney himself! Back to animation." After all, it did all start with a mouse! Tying it all together, Jo Ann Feindt, the Vice President of Southern Area Operations with the US Postal Service, appealed to our emotional side. Reminding us of the importance of sending and receiving mail. Despite all the electronic conversations that go on each day, an email will never take the place of a hand written sentiment. Oh, and if that sentiment comes with an image of Boo, Sulley and Mike? Well, you just mailed a smile! It was an amazing experience to be able to hear so many influential people talk passionately about their craft-- but the real highlight was the final unveiling of the stamps themselves. Who better to do this? Why, the characters themselves, of course! Behind the stage, the Disney-Pixar characters with their own stamps! no one sings the National Anthem like VoL! I couldn't agree more! Thanks for your comment, Donna!